Some people choose a credit card based on the interest rate or perhaps a balance transfer promotion. However, if you don’t intend to carry a balance on your credit card, you may be more interested in a rewards program. The best credit card rewards programs are tied to your interests. Here, you can check out a number of credit and charge card offers that also come with rewards. We’ve compiled enough of these programs that you’re sure to find one that matches the way you want you to be rewarded. 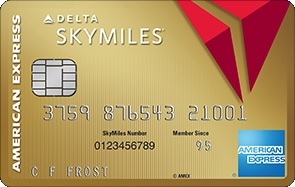 Gold Delta SkyMiles® Credit Card from American Express – American Express loves big bonuses, and the Gold Delta SkyMiles® Credit Card from American Express is no different. New cardmembers will earn 50,000 bonus miles after spending $1,000 in the first three months. Plus, you’ll get a $50 statement credit after you make your first purchase. 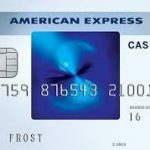 As a one-time thank you, American Express will also waive the first year’s annual fee (of $95). You’ll earn 2x miles on all Delta purchases and 1x miles on all other purchases. And your earned miles will never expire. Unlike the Platinum Delta SkyMiles® Credit Card from American Express, you will not earn bonus Medallion Qualification Miles (MQMs). But all the other perks apply to both cards. 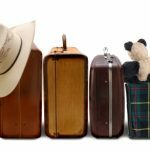 These perks include free checked luggage on your first bag (for up to 9 members of your party) and all American Express travel benefits. Biggest PRO: Big up front bonus/first year annual free waived. Southwest Rapid Rewards® Premier Credit Card – New cardholders of the Southwest Rapid Rewards® Premier Credit Card will earn 40,000 points after they spend $1,000 in the first three months of account ownership. Since I fly Southwest almost exclusively, I can tell you that these points are good enough for at least one round trip. Sometimes you can squeeze in two if you’re smart about times and flight distances. Cardholders earn double points on all Southwest purchases, including hotel and car rental partner purchases. You’ll earn single points on all other purchases. As always, when you fly Southwest, you’ll have no baggage or change fees, no blackout dates, and no restrictions on using your reward points. Every anniversary, you’ll earn 6,000 bonus points. Unfortunately, this card carries a $99 annual fee that is NOT waived for the first year. 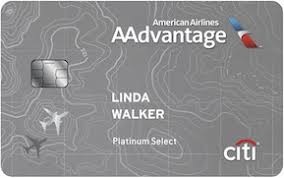 Citi® / AAdvantage® Platinum Select® World EliteTM Mastercard® – BIG BONUS ALERT: Cardholders earn 60,000 American Airlines AAdvantage bonus miles after making $3,000 in purchases during the first three months. The standard rewards program is similar to others on this list. Cardholders earn double miles per each dollar spent on all American Airlines flights and single miles on all other purchases. Every time you redeem your AAdvantage miles, though, you earn a 10% bonus. For example, if you redeem 20,000 miles, you’ll be credited 2,000 miles back! The Citi® / AAdvantage® Platinum Select® World EliteTM Mastercard® waives the $95 annual fee for the first year. It also includes perks like free checked baggage for the first bag and 25% off American in-flight food and beverage purchases. 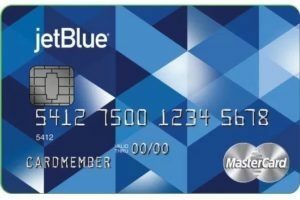 JetBlue Plus Card – One of the lower up-front bonuses on our list, the JetBlue Plus Card starts off by offering 30,000 bonus points after you spend $1,000 in the first 90 days (a common theme, for those paying attention). The larger value in owning this card, though, comes from its rewards program. You’ll earn six points per dollar on JetBlue purchases, two points per dollar spent at restaurants and grocery stores, and one point per dollar elsewhere. Cardholders of the JetBlue Plus Card get their first checked bag for free, 5,000 annual bonus points, and 50% off in-flight JetBlue purchases. This card carries a $99 annual fee. Also, if you spend $50,000 or more annually, you’re eligible to receive TrueBlue Mosaic benefits. This includes express lines, free alcohol on the plane, and higher point multipliers on JetBlue flights. 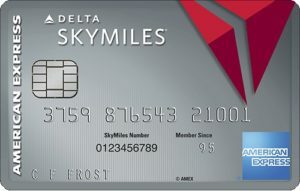 Platinum Delta SkyMiles® Credit Card from American Express – Out of the gate, American Express serves up 35,000 bonus miles after you spend $1,000 in purchases in the first the first three months. As an added bonus, they’ll also give you a $100 statement credit after you make any Delta purchase (again during the first three months). Every anniversary, you’ll receive a domestic, main cabin, round-trip companion certificate and 5,000 Medallion Qualification Miles (MQMs). Your first checked bag on all Delta flights is FREE (up to 9 people in your reservation), and you earn double miles on all Delta Airlines purchases. One last bonus to mention: every year that you spend $25,000, you’ll earn 10,000 bonus miles and 10,000 Medallion Qualification Miles. Spend another $25,000, get another 10,000 bonus and 10,000 MQM miles. The Platinum Delta SkyMiles Credit Card does, however, carry a pricey $199 annual fee. 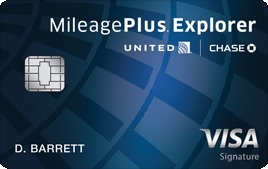 United MileagePlus® Explorer Card – Newly-approved cardholders can earn 30,000 bonus miles after they spend $3,000 in the first three months of card ownership. Add an authorized cardholders to your account and you’ll get another 5,000 bonus miles. The United MileagePlus® Explorer Card offers a standard rewards program: 2 miles per dollar spent on tickets for United flights and one mile per dollar spent on everything else. The first checked bag for you and a companion are free. You’ll also receive priority boarding on all United flights. Every year that you spend $25,000, you’ll get an additional 10,000 bonus miles — which would offset the cost of the $95 annual fee. The last benefit to mention is that every year, cardmembers will receive two United Club passes to relax before a flight ($100 value). Most credit and charge cards that offer rewards are limited to customers with good or excellent credit. If you have poor credit, you may need to work on building up your credit score by paying off credit card balances and making on-time payments before you can be approved for a points and miles credit card. While it’s great to be rewarded for using your credit card, credit cards with miles promotions or other rewards often have a higher interest rate than other credit cards. Some also have a higher annual fee in order to compensate for the rewards you’ll earn. Don’t apply for a rewards credit card unless you’re sure that you can pay off the balance in full each month. Also be sure that the annual fee won’t cancel out the benefit of the rewards you earn. Before choosing a rewards credit card, you need to decide if you want to earn cash back, gas rebates, points you can use for travel or merchandise, or airline miles that you can use to supplement your frequent flyer miles. Even if you decide a free airline credit card is perfect, you’ll need to choose whether you want to earn miles for one specific airline or miles that you can use on multiple airlines. Signup bonuses. Some credit cards offer new customers a bonus of extra points for their first purchase or a certain level of purchases within a certain time. The rate of rewards earnings. If you are looking for airline miles, look for a credit card that earns you airline miles at a rate of at least one mile per dollar spent. Some credit cards allow you to earn rewards in specific categories at a faster rate, depending on where you use your credit card. Reward redemption rules. Some credit card rewards programs require you to wait until you accrue a certain number of points before you can redeem them. Others may limit your rewards to gift cards or to flights on specific airlines. 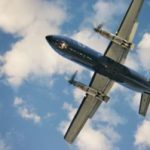 If you are looking for airline miles, check that the airlines you use are covered by each rewards program. Make sure you leave enough time to cash in your points before your next vacation if you want to use points for a hotel room. Compare your spending with the rewards. The number of points you need for a free flight varies by rewards program. Try to find the program that earns you the most points for the least amount of money or the one that allows you to convert points to airline miles at a low rate. Check the dates. Make sure your points or miles won’t expire before you can use them. Some rewards programs don’t have an expiration date at all. Also, see if your airline miles are subject to blackout dates. If you plan on traveling at a popular time, you want to make sure you can use your points. 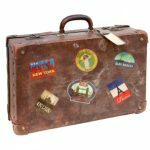 If you’ve decided that a credit card with miles promotions that you can use for airline tickets, hotels, or merchandise is best for you, compare the points and miles credit card offers on this page to find the credit or charge card that matches your needs.